One of the major roles that B cells play in an immune response is the production of antibodies, that specifically recognise and bind to proteins on the invading bacteria or virus particles. The binding of specific antibody to its target can prevent viruses from entering cells or aid phagocytes in identifying and destroying the bacteria or viruses. Given that each B cell can only produce antibody with one specificity, and that there are an enormous variety of organisms that can infect us, the immune system needs to generate vast numbers of B cells that each produce a different antibody. Figure 1. 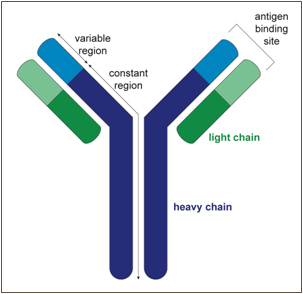 Schematic diagram of an antibody molecule composed of two heavy chains and two light chains. Both the heavy chain and the light chain comprise a variable and a constant region. The variable regions are responsible for binding of a specific protein called an antigen. The specificity of a particular antibody, i.e. 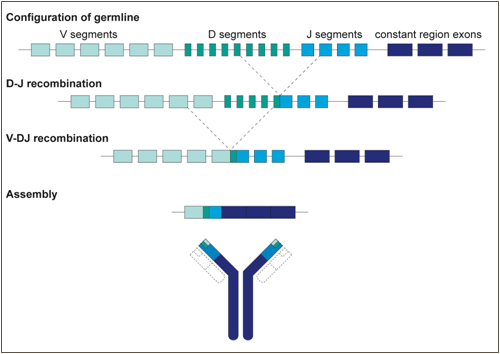 what the antibody recognises, is determined by the shape of its variable region (Figure 1); a particular antibody will bind to a protein that has a region with a complementary structure to the antibody’s own variable region. Diversity in the specificity of antibodies is initially generated at the earliest stages of B-cell development. While still at the B-cell progenitor stage in the bone marrow, B cells randomly rearrange their variable (V), diversity (D), and joining (J) genes to form the blueprint for the variable regions of their antibodies. Diversity comes from the fact that there are multiple copies of the V, D and J genes that can be joined together in different combinations (Figure 2). In a majority of mammals, each antibody molecule is composed of both a heavy and light chain (Figure 1), which each have their own V and J genes to rearrange (only the heavy chain has D genes). Further diversity is added to the variable region genes by an enzyme called terminal deoxynucleotidyl transferase (TdT) that adds extra nucleotides between the V, D and J regions, changing the structure of the variable regions that will be produced. During the course of an infection, B cells can further alter the specificity of the antibody they produce. When a mature B cell meets an antigen that its B-cell receptor recognises (the B-cell receptor comprises the antibody the cell produces anchored on the cell surface) then the B cell can undergo a process called somatic hypermutation. Here an enzyme called activation-induced cytidine deaminase (AID) makes random mutations in the antibody variable region genes. If the mutations result in an antibody that more strongly binds to their targets then these B cells will survive and may differentiate into antibody-producing plasma cells with the new specificity.